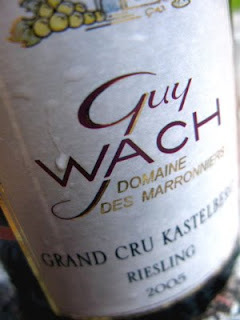 Have you heard of Guy Wach and Domaine des Marronniers? If not, you're in good company, because of all the top producers in Alsace, Guy Wach is the most discrete. Maybe it's because his firm is small and situated in Andlau, the village with three celebrated Grands Crus, including the absolute pinnacle - Grand Cru Kastelberg. Kastelberg consists of shale that is rich in easily dissolved salts. The soil heats up easily, while clay minerals which are interspersed in the shale layers hold a lot of water that prevents the maturation from being blocked in periods of drought. Shale simply make the grapes ripen perfectly every year. We ended our vacation this year by a short week in Alsace (as we tend to do every second year or so). For the most part, we retraced our footsteps to old favorites, many of them originally found through your excellent guidance: Bruno Sorg, Becker, Mittnacht Frères, Mader, Cave Vinicole de Hunawihr, Kreydenweiss, Wach, and Stoeffler (of which only Mittnacht Frères and Kreydenweiss were new acquaintances). One of the many trophies we brought with us was the GC Kastelberg Vieilles Vignes 2007, to which we treated ourselves already the evening of our arrival. I certainly have no difficulties recognizing the wine from your description, although the vintage is different. Even my wife, who normally prefers her Rieslings slim and austere, was unusually eager to add this to our collection. The price is up to 19 euro by now, but well worth it. It's good - even great! - to hear that you enjoyed your stay and your search for the holy grails. Yes - Wach's wines are simply stunning. Apparently, the family members spend most of their time in the vineyards and do not have the time to attend on occational visitors as passionately as Bruno Sorg, Bernhard and others. But when it comes to the quality and the Q/P ratio Wach is second to none. And to me - Kastelberg is #1, tied with Schoenenbourg (and a few more). Well, in our experience, both the Wachs and the Sorgs are very attentive and welcoming. I haven't had much opportunity to speak to Guy yet, but Marta Wach has certainly given us a lot of time and attention on this as well as previous visits. She is very charming and has a great sense of humour but is also very sincere and knowledgeable. At Sorgs, we've always been received by Bruno's wife on previous visits. This time, however, we had a first opportunity to talk to Bruno himself. Lovely people both of them. Humble yet proud, polite yet sincere. I very much like those combinations. Both Sorg and Wach are of course fantastic from a QPR point of view. We talked a little about marketing with both of them on this visit, and part of the reason may be that they sell most of their production directly from their cellar rather than through "middle men". This time around, we took the time to inspect Kastelberg "in situ" (along with Wiebelsberg). Did you know that they put the soil back on top of the hill several times per year, using a kind of ancient sled with a man on it, pulled by a wire attached to a tractor at the top? And that the slate at Kastelberg is of a different kind than that found in Germany (e.g. in Mosel) so pretty unique not only to Alsace? At least that's what we were told at Kreydenweiss.